I wish you happiness and joy! I wish to make a purchase. I wish to make a deposit. I wish to talk to your manager. I wish to visit my parents for the holidays. 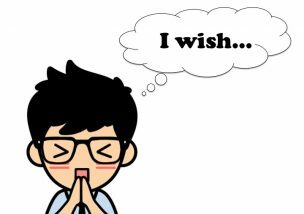 I don’t wish for anything more. I wish you no harm. If you wish to discuss this matter further please do not hesitate to contact me. I will cook whatever you wish. I wish I could speak English fluently! I wish I were in your position. I wish I knew how to fix this problem. I wish I didn’t have to work tomorrow. How I wish I didn’t have to work tomorrow! I wish I could tell you things were different. I wish that things were different. I wish we had met under different circumstances. I wish I had more information. – Your job is easy, isn’t it? – You will finish work by 6pm today, right? I wish I had studied more in school. I wish I had finished college. I wish I had left earlier this morning. I wish I hadn’t eaten so many cookies! I wish you hadn’t told me that scary story. Now I can’t sleep! I wish you had told me sooner. I wish you had paid more attention in the meeting. I wish you would stop calling me all the time. I wish you’d stop making that noise when you eat. I wish you wouldn’t talk that way to your sister. I wish he’d take things more seriously. I wish it wouldn’t take so long. Thank you for reading until the end! I wish you the best in your future endeavors!